For this installment of Cosmic Scene Investigation, we travel to one of the earliest collisions of large-scale structures in the known universe. A splatter of red (denoting galaxies) lies at the center of this image, and extends toward the lower left. These are the remnants of a cosmic collision. Aeons ago, one group plunged through another at millions of miles per hour, leaving in its wake a wreckage. The galaxy cluster ‘El Gordo‘ is all that remains of this raucous event, which took place less than a billion years after the universe started. From the deserts of Chile, the Atacama Cosmology Telescope was the first to detect this prodigious system. NASA’s Chandra X-ray Observatory, the European Southern Observatory’s Very Large Telescope, and NASA’s Spitzer Telescope have also collected forensic evidence across the energy spectrum, from the infrared to the X-ray. All put together, we see a system similar to the infamous Bullet Cluster: a pair of clumps converted to a churning, violent amalgam of hot gas, dust and light. An extremophile in the truest sense, El Gordo is the earliest-occurring cluster of its caliber. Its hot gas is burning at 360 million degrees Fahrenheit (200 million degrees Celsius), and it weighs in at a million billion times the mass of Earth’s sun. Compare this to the Virgo cluster of galaxies, the celestial city that holds our Milky Way and its neighbors. El Gordo’s mass is about the same, but it is over a hundred times hotter. Dark energy is the name given to that substance, that energy, that is making spacetime spread out faster and faster. In the early universe, the small chunks that make up El Gordo were able to overcome dark energy (if it even existed then) and move toward each other to produce this cosmic crash scene. How many more like it are out there? The case remains open. To read more about the curious case of the big old cluster, see the peer-reviewed paper and the press release from Chandra X-ray Observatory. The light is going the distance. Some celestial (light-producing) objects are farther away than others. The three larger galaxies in today’s image are nearby, located in the Fornax galaxy cluster. As you can see, light comes from other galaxies much farther away: the smaller points are galaxies, too. We measure the patterns in the galaxies that are far away from us and compare that to the patterns of the nearby galaxies. Differences in this pattern give us indispensable clues about how dark energy has affected space-time over the last several billions of years. And some of the bright points (galaxies) are behind the large galaxy near the center (NGC1374), yet we can see them. What does that tell us about the brightness in different parts of galaxies? If you look closely, we can see background galaxies (those behind) everywhere—except a small patch near the center. This is due to the fact that the centers of galaxies are brighter than their outskirts. Light from distant regions of space can travel up to billions of light-years, to accidentally land here on Earth — to land on a small spot on the side of a mountain in Chile, where the Dark Energy Camera is waiting to capture it. To measure the expansion of the universe, the Dark Energy Survey needs to measure light from hundreds of millions of galaxies, all differing in their colors, brightnesses and locations. These properties will betray their patterns, which we must decipher. Light travels the distance, and we’re hunting it all the way. In a sea of darkness, innumerable points of light come into focus. While there are some stars visible here, nearly all the red, blue and yellow objects are galaxies. In the lower left and upper right, some of the blue galaxies show off their beautiful spirals (similar to our own Milky Way). The blue color and the clear structures (bars, spiral arms, dense clouds) within these galaxies betray their basic nature: newly birthed stars emanate the blue color and the very existence of the structures means that these galaxies live in a pristine environment where gravity is the dominant force acting to clump things together. All in all, these spiral galaxies are thus relatively young. In stark contrast, the yellower and redder galaxies have stopped forming new stars and are often referred to as ‘red and dead.’ These galaxies have endured turbulent lives: having been rocked by collisions with other galaxies, they are too hot to form stars. What’s more, all the work that gravity did to make structures within has been washed away leaving just bright cores, diffuse outskirts and elliptical shapes (and so they are named ellipticals). 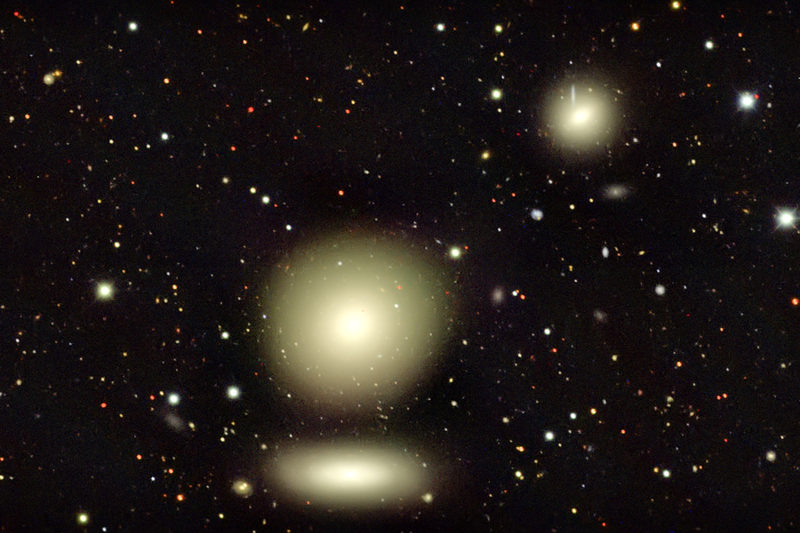 Several elliptical galaxies appear clustered (just left of center of the image). These galaxies are gravitationally bound as a group or cluster. This cluster has 43 galaxies (can you find them all? ), and it was one of the clusters discovered by George Abell and collaborators during the 1970’s and 80’s as part of the Southern Sky Abell Catalog (published posthumously in 1989). 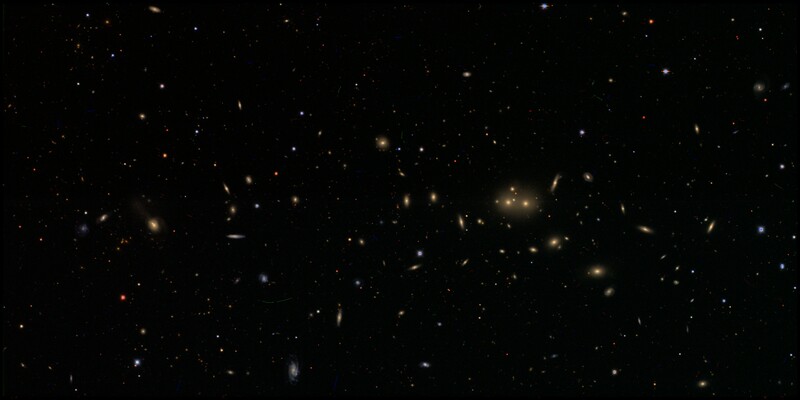 Amazingly, these clusters were discovered and measured with the human eye using photographic plates, rather than the electronics that the Dark Energy Survey uses, and they are part of the earliest comprehensive collection of optically observed clusters started by George Abell in 1958. Our cluster here is Abell Catalog No. 3151 (out of over 4000), located in the Fornax Constellation. It lives just about one billion light years from Earth (actually quite close compared to the most distant clusters) and spans about five million light years from end to end. What has dark energy done to this cluster? Galaxies within a cluster gravitate toward one another, because galaxies have mass. In contrast, dark energy stretches the fabric of space-time, upon which galaxies reside. Thus, dark energy directly opposes gravity. Dark energy can affect larger objects like clusters of galaxies, but isn’t strong enough to pull apart stars, solar systems or galaxies (where gravity is much stronger). If gravity serves to pull massive objects (like galaxies) toward one another, then dark energy will pull them away from each other. There are millions and millions of families of galaxies across the universe, and dark energy will make them smaller. What’s more, you’ll find small colored streaks randomly dispersed throughout the image. These come from very high-energy (fast!) cosmic rays that hit the camera’s detectors but briefly, leaving small imprints in the image. These cosmic ray streaks are just one type of artifact that have to be cleaned out of the images before cosmological questions can be asked. In future posts, we’ll discuss more about the data reduction process. If you want to find Abell 3151 yourself, look at coordinates RA (03:38:16.61) and DEC (-28:50:32.28) in units of Degrees:Minutes:Seconds; it may be hard to see if you’re in the the Northern Hemisphere. What other kinds of cosmological structures do you think will be affected by dark energy? Why is gravity stronger than dark energy amidst smaller structures? Email us at darkenergydetectives@gmail.com if you have clues, questions or comments about anything cosmology.